CRAWFORDSVILLE, Ind. 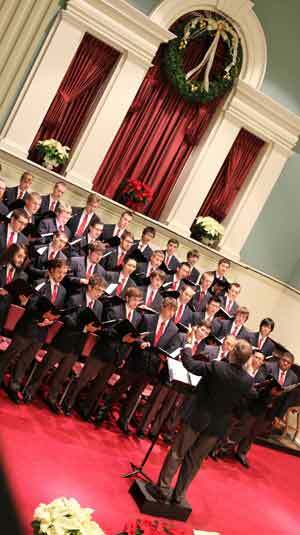 – Continuing a longstanding holiday tradition, Wabash College presents its 46ths annual Christmas Festival of Music and Readings, Wednesday, Dec. 11, in Pioneer Chapel. Begun in 1968, the Christmas Festival of Music and Readings alternates performances of musical numbers, congregational hymns, and readings from the Bible, and is modeled on the King’s College Festival of Lessons and Carols at Cambridge University in England. Preludial music of the season begins at 7:30 p.m. and the Festival follows at 8 p.m. This year's Festival features several Wabash music organizations, including the Brass Ensemble, the String Ensemble, Wamidan, the Glee Club, and the Glee Club T-Tones. Miscellanea Musica, a Lafayette-based recorder ensemble, will also perform. Lisa Lowry, adjunct instructor of voice, will present a vocal solo, while Samuel Vaught and Cheryl Everett will play several organ selections. The readers for the evening include Joe Haklin, Scott Feller, Chris Duff, Wes Adams, Rachel Barclay, Jorge Diaz-Aguilar, Zeno Joyce, Joyce Burnette, Micah Chowning, and Tobey Herzog. The program is free and open to everyone. Dress is casual. Following the Festival, there will be reception in the Sparks Center, catered by Bon Appetit.